Quick Renewal™ 5-Day Cleanse / 5-day - Nature's Way®. Why use an "in-between" cleanse? Because it's easy to get side-tracked from healthy living. Toxin absorption doesn't stop in-between cleanses. It lets you cleanse on your terms. It uses a unique, non-stimulant Laxative Blend. It provides fiber with True Dispersion™ Technology. Triple-Action Cleansing Formula: Day 1 through Day 4: Take 4 tablets at bedtime with 8 oz of liquid. Day 5: Take 2 tablets at bedtime with 8 oz of liquid. Reduce dosage if you experience abdominal discomfort or diarrhea. If discomfort persists, discontinue use. Fiber Fusion™ Daily gentle cleansing fiber: Mix 1 packet with at least 8 oz of liquid or your favorite beverage. Caution: Take this product with at least 8 oz of liquid. Taking this product without adequate fluid may cause it to swell and block your throat or esophagus and may cause choking. Do not take this product if you have difficulty swallowing. If you experience chest pain, vomiting, or difficulty swallowing or breathing after taking this product, seek immediate medical attention. If pregnant, nursing, or taking any medications, consult a healthcare professional before use. Why is magnesium hydroxide in the Gentle Renewal 5-Day Cleanse? Is it effective? 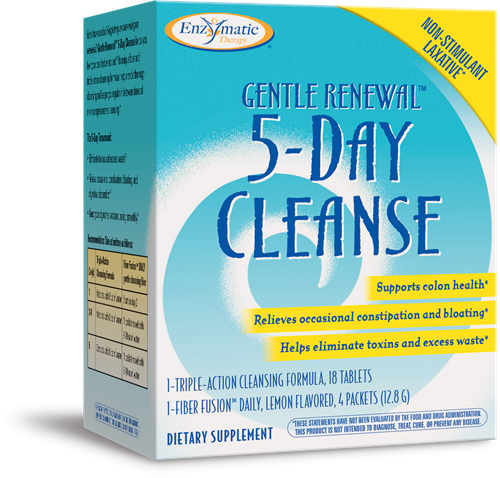 Why was psyllium chosen as the source of fiber in Gentle Renewal 5-Day Cleanse? Do not use if you are pregnant or nursing, attempting to become pregnant or under the age of 12. Do not exceed recommended dose, or take longer than the recommended period as frequent or prolonged use may result in dependence. Do not use when abdominal pain, nausea or vomiting are present. Do not use if you have gallstones, intestinal obstruction/inflammation, obstructions of the bile duct or serious liver conditions. Do not use if you are allergic to plants of the Asteraceae (Compositae) family including ragweed. People with impaired kidney function, should only use boldo under the supervision of a qualified professional. Consult a healthcare professional if you notice a sudden change in bowel habits that persist over two weeks. Rectal bleeding or failure to move bowels after use may indicate a serious condition. Discontinue use and consult a healthcare professional. This product contains Slippery Elm which should not be taken together with any medication as it may interfere with their absorption. If you have diabetes, gastrointestinal disease, or are taking any medications, consult a healthcare professional before use.